The team is on the road again this month. We have been taking our new Mobile Knowledge Booth all around schools in the Northeast of Thailand, using games and activities to teach girls about protecting themselves and making healthy life choices – all in the space of a lunch hour! We’ve found that the best way to reach rural girls is within school time – when everyone is gathered in one place and they are free of other obligations, like helping out on the family farm or looking after younger siblings. Since opening our second branch in the Northeast in 2011, we have worked closely with local schools to deliver training within the timetable. This has proven a very effective way to reach underprivileged girls in the region. To make sure that girls in these schools are not held back, we have created a new concept – the Mobile Knowledge Booth – especially for schools that are unable to spare time or space for our usual 3 hour workshop. We simply request permission to station our booth in the playground during lunch hour, and then we run games and activities on the spot. Where possible, we always conduct a workshop – however, where we can’t, this new method is making sure that we can still reach as many girls as possible with the guidance they need. We recently started using the booth and it has been very well received. 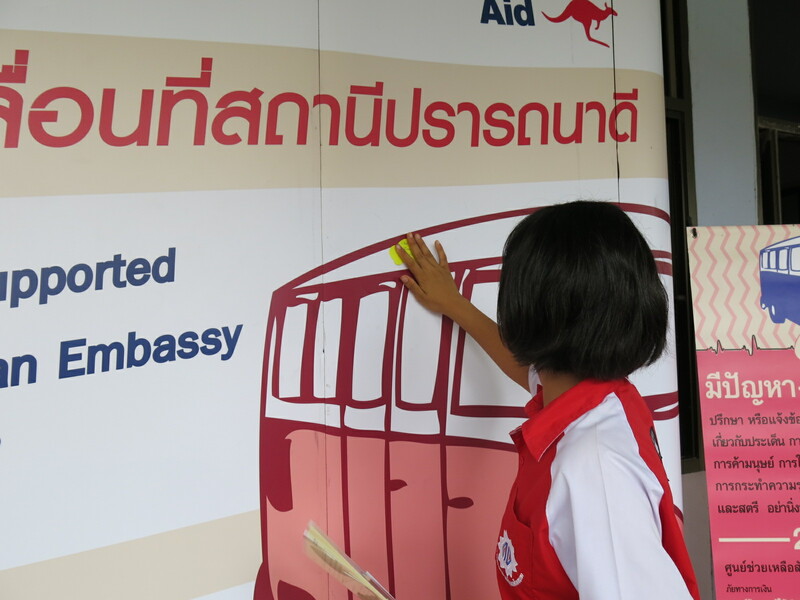 We were lucky that the Australian Government through the Embassy’s Direct Aid Program agreed to cover the costs of creating the booth and sponsored a short trial period, where we were able to reach over 800 girls across 10 schools in Ubon Ratchathani. This is a huge step forward in the number of girls we are able to reach in rural areas. The key thing we make sure students at the booth learn is the different types of violence that may occur and the telephone number of organizations to call if they face this problem. Each student receives a brochure and small card that has this information on. The booth concept is completely new and we are the first organization to run a booth like this. Teachers and students were impressed and excited to see the booth. It worked well for the schools to run the booth mostly in the lunch period, as it does not need to interrupt class time. We normally run the booth from 11am to 1pm and at some schools the teachers finished class early so that students can visit our booth. The games we run allow the students to read through the information we present in the booth and try to answer questions. Each person learns different things. As a result, we saw them discussing and helping each other to answer the questions. Since the booth is open for anyone to visit, we have to develop our content to make it easy to understand. This is because most of the time we have so many students join the booth that we can’t manage to spend more time with each student if they are unable to read and understand by themselves. We may need to consider using more staff to run the booth or allow only a limited number of students in each time. It is interesting that the booths also helped the teachers as well, who said that this is good for the students and also helpful for themselves in case something happens in their own life. We noticed that the teachers were more encouraged to make sure students can attend a full workshop in future, after seeing the information we provide at the booth. The booth is very comfortable and easy to share a short period of learning. It is very useful for students who do not get the opportunity to join our full workshops. Students are really excited when they try practicing self-defense and they enjoy ‘learning by doing’. However, in the time period, they can only learn few easy techniques but they do not learn about the principles of self-defense. In the future, we will aim to add some essential principles of self-defense in the booth activity, so that students know the value and use of self-defense and when it is and isn’t appropriate to use. This is a useful activity, because we provide the information via a lot of pictures and games. The games allow students to remember information more than they would if they just had to read it themselves. Students are happy and enjoy the activities when they get the refreshments (as a treat in return for joining in their lunch break). This content is not too heavy like a full workshop. The information on some subjects is hard for students to understand at a booth by themselves, so it needs staff to explain. This usually happens at schools that had never run anything like this before and so the concepts are unfamiliar to students. Some of these students struggle with reading and writing too, which makes it more difficult for them. In the future, we will make sure we add more pictures and make the content very simple and easy to read and understand.